So, what’s the big deal about the eggs in the pic to the left? Why bother to post an image of a nearly-full egg carton of eggs on a blog about layers? Well, because these are eggs from a 10-year old Easter-egger, Goldie, and a 7-year old Langshan, who earned the descriptive name of “Whah” for the peculiar little cluck she greets me with every morning. Despite Interior Alaska being full on into the long, dark winter days, Goldie, after years! of not laying, started up again at the end of October, and she hasn’t stopped yet. As of this posting, she has laid close to two dozen eggs – (averaging about 4 a week) and Whah, although not quite as prolific, lays about 2 a week. Suddenly, after being eggless for a number of years, and resigning myself to buying fresh eggs at a local feed store (still way, way cheaper than keeping a backyard flock, but not quite as much fun), I have eggs again. Of course, I don’t expect the egg-run to last. Goldie is, after all, quite the elderly hen, and perhaps this is her last hurrah before stepping off the mortal coil. None-the-less, it’s delightful to once again go out in the morning and find a pretty blue egg in the nest box. It makes me even think about going back to keeping layers, as right now my flock consists of old birds in retirement: Goldie, Whah, Old Hen (who is 12) and Gandalf, a roo of about 6. For the moment, though, I have stopped expecting to see one of the oldsters keeled over when I visit the coop first thing in the AM, and now have been slipping into the habit of discovering one or two eggs. It feels a little bit like a gift from Goldie for all of the years of keeping her and her flock mates safe, warm, and well fed. And who knows, maybe it will spur me into the decision to get a few new layer chicks this spring! …chicken-themed presents. How many amongst us hobbyist flock-keepers have received such gifts for birthdays, holidays or just because? I think it is safe to say that nearly all of us have – from friends or family who just couldn’t resist that cute little ___________ (fill in the blank with your poultry gift of choice). Personally, I love all of the chicken gifts I have received since I started keeping layers over a decade ago. Chickens have sprung out of gift boxes and wrapping paper adorning all sorts of items – both practical and whimsical. There are the the pot holders and kitchen towels covered in chickens, the white and black hen salt and pepper shakers, the mug with the chicken on it, and the chicken what-not that simply sits on the shelf. I have chicken wall hangings, numerous stuffed chickens along with one lone stuffed duck, hand-crocheted chicken doilies, and a chicken that lays jelly-bean eggs. There is the rooster stained-glass rondel, hand-drawn chickens, chicken fridge magnets, several chicken tree ornaments, and – my favorite – a clock in the shape of a flying chicken. In recent years, keeping chickens has increased in popularity – as has, it seems, chickens as a decorative motif, and thus as sources of poultry-related gifting. Or perhaps the sighting and gifting of chicken tchotchkes is the Baader-Meinhof Phenomenon in action: friends and family are a titch more preternaturally aware of chickens because someone they are close to keeps chickens. That is why, even though chicken-laden objects are plentiful in my house and office, I enjoy and cherish every odd one of them: they are mementos and reminders of the times my friends and family thought of me as they picked out that chicken timer/mug/potholder/pillow/rug/tea kettle/basket. ….from our flock to yours! This is a question that I am frequently asked, and a flippant answer might well be: as long as the flock keeper decides they should live. Many people think that chickens are short-lived, and in our modern, factory-farming approach to eggs and chickens, they are: the average layer is culled at three years when her egg-laying naturally begins to taper off, and many layers may be culled as soon as their first molt occurs. For people who prefer a less-utilitarian approach to their layers – backyard chickens can live for a decade or more. The average is about 8 to 10 years for a chicken that is healthy and kept safe from predators, although there are reports of pet chickens living well into their teens. Possibly one of the most famous long-lived birds of our modern era of backyard flocks was Victoria, a crotchety black rock hen, which according to an article in the Daily Mail in 2013, laid two eggs at 17. Consideration of layer longevity cannot be divorced from the other question of how many eggs can a chicken lay? After all, the primary reason for keeping layers is to have a steady supply of fresh eggs. Like humans, hens are born with a specific number of eggs. How many they actually will lay over their lifetime is tied to their health, lighting and diet. Generally, during her first two years, a hen will lay about 200 eggs a year; starting in year three, egg production declines by 1/3 to 1/2 of her first year egg production. The amount of light (natural daylight is always better, but not always realistic in Alaska) that a hen is exposed to affects her laying schedule. Again, like humans, the low-light days of winter signal to hens that it is time to slow down. Many flock-owners, commercial and backyard, maintain a steady supply of eggs through fall and winter by exposing their layers to long hours of artificial light (>12 hours). While this will keep most hens laying, it does not give their bodies the natural downtime needed to recover from the heavier schedule of egg-laying during spring and summer months. This may lead to earlier mortality and somewhat increased chances of disease susceptibility, however, this does not militate against the practice for flock-owners seeking to maximize egg production through the steady replacement of two to three-year old birds with new young ones. In over 14 years of having a backyard flock, I have always kept my chickens through their natural life cycle, and currently have four elderly, but spry, birds – all of whom are 10 or older. As an additional, admittedly unscientifically-based plug for the benefits of keeping older birds, I have never had any of the terrible bad habits (cannibalism, feather-picking) that can plague backyard flocks. I believe this is because an all-ages, diversified flock (including a rooster) is more in keeping with the natural flock habits of chickens – which, like sled dogs, prefer hierarchal groups. It is my oldest hen, who at 11 is really the flock head – she keeps all of the other ladies and rooster in line. Although it is not a philosophy for everyone, it can be beneficial in effect to keep the older hens around, even after their peak egg production has stopped. 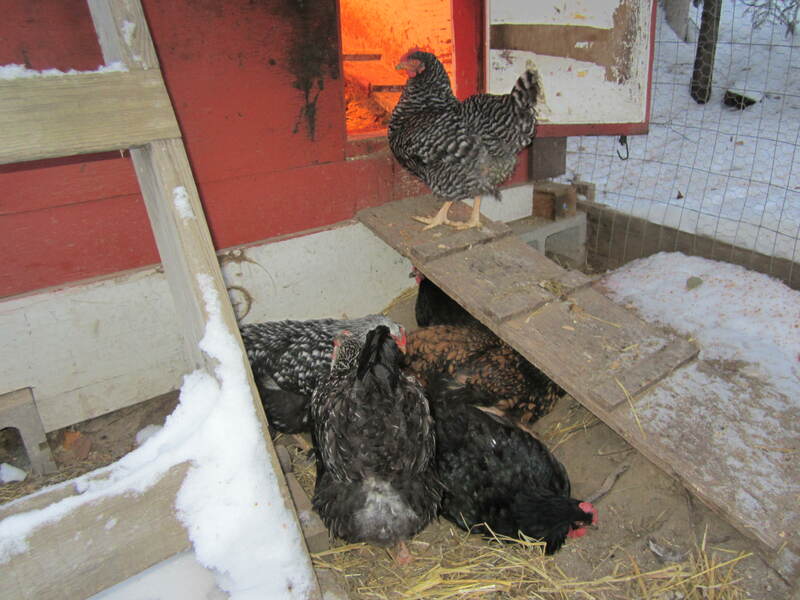 Warm enough in Fairbanks on January 11 that the chickens are out and dusting.